My son loves to play with legos. I think they are his absolute favorite thing in the whole world. He has at least two or three lego parts in his hand at any given time during his waking hours. I think he even has legos in his bed. I decided to take his love for legos and turn it in to a learning experience. I came across a blog about legos. They had turned it into a lapbook project. I have never done a lapbook before but I thought this sounded really cool. I was talking to a few other homeschooling moms about it and they decided that they would love to join in the fun. So we are meeting once a month to work on our lego lapbooks. The first time we met we talked about Ole Kirk Christiansen the inventor or legos. We learned that he was from Denmark so we found a map of Europe and located Denmark on the map. We learned that the word lego actually comes from the Danish words “Leg Godt,” or “play well.” (Appropriately, “Lego” also means “I study,” or “I put together” in Latin). Did you know that the first legos were actually made out of wood? The project for the kids to complete that day was to make the flag of Denmark out of legos. We took pictures of their flags so they can include the pictures in their lapbooks. The second time we met we talked about the lego company. We learned what a mission statement is and we learned how the lego bricks are made. We watched a couple of videos about the process of making lego bricks. The project for the day was to build a ship without any directions. The third class was about how legos are designed and what you can design with legos. We talked about words such as “Interference Fit” and “Friction”. When you press the lego bricks together the studs press against the walls and tubes and push them open a bit. This is what makes the bricks lock together. The bricks are resilient so when you take them apart they go back to their original shape. The building challenge for this class was to make a mosaic. The last class used several different learning activities. We learned how to use the bricks to help with multiplication. Some bricks have two studs across and three studs down. Two times three equals six. We also learned about graphs. The kids each got a cup full of legos. They sorted them by color. Then they made a graph to show how many bricks of each color they had. I think everyone had a great time with the lego learning group. We are looking for another topic so we can do it again. We haven’t started a study of history as history yet. We have been attending a lot of historical sites. Mostly we have gone to places that depict life in the early 1800’s. I am very interested in this time period. So I try to get my son interested in it as well. I really can’t tell you if it is working or not. He seems interested for a while. But then he wants to go outside and play with his friends instead of listening to the speaker. Some of the places we have visited include Historic Speedwell. We have attended their homeschool classes all summer. They started in the spring by digging in the garden of the Vail homes in Morristown, New Jersey. The next month they planted seeds in little paper cups. The following month the planted their tiny fledgling plants in the garden. Later in the year they harvested the plants. Another month they learned about making crafts. Everything was done as it would have been done in the 1800’s. Another place we visited was Cooper’s Grist Mill. During one class the kids got to practice sewing on an old treadle sewing machine. Then they learned how to card wool and they got to see an old spinning wheel. They washed clothes in an old wringer washing machine and hung them on a clothes line. Many of the kids were amazed when I said that was the way I washed clothes when I was a child. A few months later we went to a demonstration of how they made candles over an open fire. The next month the kids got to help press apples and turn it into apple cider. 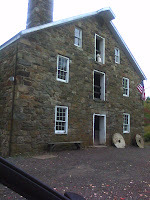 Each month the class also included a tour of the mill and a demonstration of how to grind the wheat into flour. We also visited Fosterfield’s Farm. There the kids each made a small bag on the treadle sewing machine. They saw how food was canned and preserved for winter. Another month they had a display of antique automobiles. We went to Thomas Edison’s House and saw all the old cars there. One thing that really fascinated my son was the turn around. Cars did not have reverse. They only went forward. So they drove the car into the shed and parked it on a turnstile. When they wanted to take the car out of the shed, they had to turn the crank to turn the turnstile by hand. This would spin the car around so it was facing the door. Then they could drive it out. They also had a very old record player that used cylinder shaped records. I don’t know what era we study next year. But it certainly was fun visiting all these sites this year.